Written in 50-minute episodes by playwright Howard Brenton and directed by Rob Walker, the 4-part 1986 series Dead Head features a top-notch cast including Denis Lawson (Bleak House, Holby City, Perfect Sense) as Eddie Cass, Don Henderson (Star Wars, The Adventures of Baron Munchausen), George Baker (The Spy Who Loved Me, On Her Majesty's Secret Service), Simon Callow (Amadeus, Four Weddings and a Funeral) and Lindsay Duncan (Rome, Under the Tuscan Sun). 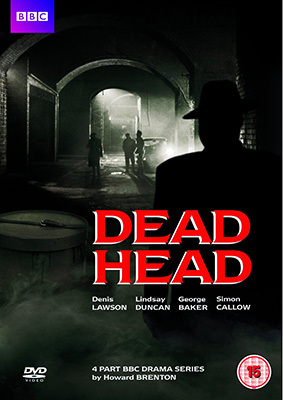 Highly regarded but never repeated after its first screening, Dead Head will be released as a 2-disc DVD set on 15th April 2013 by Eureka Entertainment at the RRP of £20.42. Commentary on Episode 1 & 2 with Writer Howard Brenton.